What is covered under the primary LSO program POLICY? Expanded coverage regarding counterfeit certified cheques and counterfeit bank drafts came into force on January 1, 2010. As of January 1, 2010, if certain requirements are met, some OVERDRAFT protection is provided in relation to trust accounts where liability for the OVERDRAFT results from the handling of a counterfeit certified cheque or counterfeit bank drafts. This enhancement was added at no additional cost. Moreover, it provides broader protection than that generally afforded under other professional liability programs, some of which would not cover the loss of disbursed trust funds belonging to legitimate clients. Why all the conditions or limitations to the enhanced coverage? 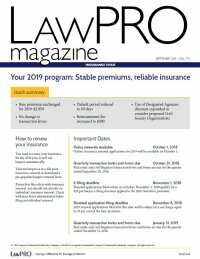 LAWPRO is mandated to operate in a commercially reasonable manner and to ensure that the cost of insurance under the program generally reflects the risk. This includes responsible underwriting and encouraging active risk management on the part of LAWYERS and LAW FIRMS: The requirements that are attached to this enhanced protection moderate the risk of CLAIMS against LAWYERS as well as the insurance program, and strive to equalize the likely impact on the insurance program arising from the different practice areas of the bar. What are the requirements and limitations that apply to this enhanced coverage? You must have waited at least eight business days following deposit of the instrument into your trust account before disbursing funds as instructed; or you must have received confirmation from either your financial institution or the drawee financial institution that the drawee financial institution has verified the validity of the instrument. As well, this confirmation must be documented in writing (whether by you or the financial institution) before payment instructions are given. The drawee financial institution indicated on the counterfeit certified cheque or counterfeit bank draft must be a CANADIAN FINANCIAL INSTITUTION, and the instrument must have been inspected and deposited by you, or a partner or employee of yours. The amount of coverage is subject to a sublimit of $500,000 per CLAIM and in the aggregate (i.e. for all such CLAIMS for which notice is received by the LAWYER or LAWYERS in the LAW FIRM that year), inclusive of CLAIM expenses, indemnity payments and/or costs of repairs. The coverage does not apply to retainer deposits, untransferred fees, or other amounts relating to legal fees, accounts or fee arrangements. As well, some limitations in DEDUCTIBLE may apply. I have a large volume real estate practice and having to check each certified cheque and bank draft is not practical. Does this mean that I don’t have coverage if I don’t follow the requirements outlined in the POLICY? The program generally provides protection in situations where funds of legitimate clients were inadvertently paid out to fraudsters prior to the LAWYER discovering that he or she was dealing with a counterfeit certified cheque or bank draft. You have coverage for shortfalls that are strictly between the LAWYER and the bank – i.e. no legitimate client funds were taken, or the amount of funds disbursed exceeded that belonging to legitimate clients – only if you follow the requirements explained in the FAQ above. Do I need to verify the validity of the funds that come from the lender? To be able to call on this enhanced protection, you need to verify the transaction-specific certified cheques and bank drafts in accordance with the steps outlined in the POLICY coverage. LAWYERS may need to modify their practices to request that clients give advance notice of who the lender is some time before closing, so you can satisfy yourself as to how funds will be delivered by the lender. Am I required to contact the issuing financial institution with a copy of the cheque as received and obtain confirmation in writing that the certified cheque is valid before I may withdraw funds? No, as described in the FAQ above, you may either obtain the required confirmation and have this documented in writing (either by you or the financial institution), or wait at least eight business days following deposit of the instrument, before disbursing funds as instructed by the client. What happens if the issuing financial institution fails or refuses to respond? If the certified cheque or bank draft has already been deposited, and the financial institution refuses to verify that the instrument is valid, you can as an alternative wait the required eight business days after deposit of the instrument before disburse funds as instructed by the client. If the certified cheque or bank draft has not yet been deposited, you could seek instructions from your client to have the person or entity provide the funds by wire transfer using the Large Value Transfer System (LVTS). We have contacted the drawee financial institution to confirm the validity of the instrument, but they won’t provide us with any information because of privacy concerns. Do you have any suggestions? You may want to contact your own financial institution and ask them to make inquiry of the drawee financial institution to see whether it has confirmed the validity of the certified cheque or bank draft instrument. I was able to obtain the verbal confirmation of the validity of the instrument from my financial institution (who contacted the drawee institution), but they say that they won’t put the confirmation in writing. Does the written confirmation have to come from the financial institution? No, as indicated in the POLICY coverage, the confirmation can be documented in writing by either the financial institution or the LAWYER. If you are the one undertaking the documentation of the confirmation, you would send the confirmation to whomever provided you with the verbal confirmation. Is there a format or form that has been approved that will allow us easier access to the information from the financial institutions on a timely basis? No. There is no specific format or form that needs to be followed. You are looking for confirmation that the CANADIAN FINANCIAL INSTITUTION indicated as the drawee financial institution on the face of the certified cheque or bank draft has verified the validity of the certified cheque or bank draft. In inquiring as to whether the drawee CANADIAN FINANCIAL INSTITUTION has verified the validity of the certified cheque or bank draft, and in documenting in writing that confirmation, it is best to avoid any reference to words such as “clearing” or “settling,” as these terms may not be understood by all to indicate the final and irrevocable movement of funds. the dollar amount of the certified cheque or bank draft. My bank has advised that some drawee financial institutions are not willing to provide even verbal confirmation of the validity of certified cheques or bank drafts as they don’t want to be ‘on the hook’ for providing confirmation that may later turn out not to be true. In asking for confirmation, you are looking for verbal confirmation that the drawee financial institution has verified the validity of the certified cheque or bank draft. The drawee financial institution may not be in a position to provide you with the requested confirmation if they have not yet completed this process and do not feel that they are able expedite the process. In the absence of any confirmation that the drawee financial institution has verified the validity of the certified cheque or bank draft (and documentation of such in writing), you will need to wait the required eight business days after deposit of the instrument before disbursing funds as instructed by the client to have the enhanced coverage for a possible OVERDRAFT under the POLICY. It is up to the LAWYER to decide whether or not he/she wishes to take steps to ensure that the OVERDRAFT coverage will be available. If it is known beforehand that the particular drawee financial institution is not prepared to provide verbal confirmations as a matter of course, you may wish to address beforehand the possibility of wiring funds using the Large Value Transfer System (LVTS). My bank says that they are going to start charging me a service charge if my practice is to obtain a confirmation on each certified cheque and bank draft that I obtain from my clients. This will increase the cost of my fees to the client if I have to disburse this charge. If it becomes your bank’s practice to charge for confirmations, you should consider alternatives with your client, such as the wiring of funds using the Large Value Transfer System (LVTS), waiting the required eight business days after deposit of the instrument before disbursing funds, or perhaps approaching the drawee financial institution for confirmation directly. For information on disbursing out-of-pocket fees to clients, refer to Rule 3.6 of the Rules of Professional Conduct. Waiting eight full business days is not possible. Is there an alternative? If you cannot wait the eight business days, you may prefer to obtain confirmation from either your own financial institution or the drawee financial institution that the drawee financial institution has verified the validity of the certified cheque or bank draft, and had this confirmation documented in writing (whether by you or the financial institution) before payment instructions are given. If no financial instrument has yet been received, you may wish to address the possibility of receiving funds by wire using the Large Value Transfer System (LVTS). Is it a good idea to advise my client about the necessity of wire transfers using the Large Value Transfer System (LVTS) in my initial retainer letter? Yes, advising the client about your new approach to funds handling will clarify expectations from the outset. You may also want to include in the retainer letter a requirement that the client give you notice of who the lender is some time before closing, so that you can satisfy yourself about how funds will be delivered by the lender. Do I need to verify all certified cheques and bank drafts provided by my clients? LAWYERS should use their best judgment in determining what due diligence should be done with respect to certified cheques and bank drafts. However, in using that judgment, if the steps outlined in the policy coverage are not followed, no coverage for any OVERDRAFT would be afforded under the POLICY. Can the written confirmation of the verification of the validity of the instrument be a memo in my file? No. The written confirmation that the drawee financial institution has verified the validity of the certified cheque or bank draft must be sent by the LAWYER to the CANADIAN FINANCIAL INSTITUTION providing the confirmation or be received by the LAWYER from the CANADIAN FINANCIAL INSTITUTION. If I use wire transfers, my bank only guarantees that wire transfers will be completed within a 48 hour period, does this mean I’ll have to ask my client to provide closing funds earlier? Unfortunately, LAWYERS may not be able to do “business as usual” and will need to modify their practices, including requesting funds to be exchanged via wire transfer. Confirm with your bank that wire transfers are to be done using the Large Value Transfer System (LVTS). I am aware of the LVTS system, which eliminates the need for certified cheques and bank drafts, but my real estate practice isn’t large enough volume to justify the added fees. Do you have any other suggestions? The extra fees associated with using wire transfers through LVTS (Large Value Transfer System), may be a small price to pay when compared to the costs of a fraud CLAIM – or worse, the reality of a trust account shortfall for which there is no coverage. Another way to approach the issue may be to educate your client about your new approach to funds handling. For example, in your retainer letter you could require that your client wire you funds for the cash portion of the transaction and give you notice of who the lender is some time before closing, so you can satisfy yourself as to how funds will be delivered by the lender. What do I do if I think a matter I am handling may involve a fraud? Call LAWPRO at 1-800-410-1013 or 416-598-5899 if you suspect you have completed or are acting on a matter that appears like it might be a fraud. We will talk you through the common fraud scenarios we are seeing and help you spot red flags that may indicate you are being duped. This will help you ask appropriate questions of your client to determine if the matter is legitimate or not. In the event the matter you are acting is a fraud and there is a potential claim, we will work with you to prevent the fraud and minimize potential CLAIMS costs. Read our Cybercrime and Bad Cheque Fraud Fact Sheet to see common red flags of fraud. Should I allow my client to make direct transfers into my trust account? It depends. Funds can be directly transferred to an account in several ways: as wired funds through the Large Value Transfer System (LVTS); as an automated funds transfer (typically used to move funds from one bank to another); or as an inter-branch wire. Transfers made by wire through LVTS are fine as they are irrevocable. Transfers by automated funds transfer (one bank to another) and inter-branch wires (different branches within the same bank) are generally done through SWIFT (Society for Worldwide Interbank Financial Telecommunication), and can be pulled back by the bank that made the transfer, as they are the equivalent of an uncertified cheque. Care should be taken especially in the case of inter-branch wires which, despite the name, are not done through LVTS and therefore do not carry the LVTS benefit of irrevocability. Be aware of the differences in these transfer types and understand how to recognize from the transfer confirmation what type of transfer has occurred. Should I let my client deposit a certified cheque or bank draft directly into my account? No. If your client makes the deposit, you have no opportunity to examine the cheque or bank draft for validity before it goes into your account, nor do you have an opportunity to verify the validity of the instrument with a financial institution before it is deposited. Both of these steps are critical for preventing fraud. As well, if you want the benefit of the enhanced coverage for OVERDRAFTS, you must either wait eight business days before disbursing funds or have taken the required steps to verify the validity of the deposited funds. Will the fraudster always be a new or first-time client? No. While in many cases the fraudster has been a new or first time client at a LAW FIRM, we have also seen attempted and successful frauds where a client will retain and pay a LAW FIRM to do work on a smaller apparently legitimate matter (e.g. an incorporation), and then come back with the fraudulent matter several months to a year or more later. Knowing your client and recognizing potential fraudsters goes beyond the simple fact that you have acted for a client once before. Will the emails from fraudsters be very obvious? Probably every lawyer in Ontario has received an email that is clearly an attempt at fraud. The clues can include one or more of the following: promises of large sums of money, a scenario that doesn’t add up, bad grammar and many spelling mistakes. While the really bad emails are easy to spot, the really good ones are not. LAWPRO has seen attempted and successful frauds initiated by emails that had little or nothing in them that would raise suspicions. In some frauds, we have seen emails that appear to come from another lawyer (or the staff person of a lawyer who has conveniently gone on vacation). The email will include links to a real law firm’s website, where there will be information on the lawyer who allegedly sent the email. However, a careful inspection will show that the email address and phone number for the supposed sender will not be legitimate (i.e., consistent with the correct information on the real firm’s website). They will put you in touch with the fraudster instead. The AvoidaClaim.com blog has an extensive and regularly updated list of names associated with counterfeit cheque frauds. If you are suspicious of an email you can do a search for names, email addresses or keywords in the email and that may confirm that you are dealing with a confirmed fraud attempt. Will the fraudsters only contact me by email or telephone? No. While the initial contacts on a fraudulent matter might be an email message or phone call, we have seen frauds in which the perpetrators visit a LAWYER’S office multiple times over weeks or even months. Fraudsters will provide valid-looking identification, including an Ontario driver’s licence. Is an Ontario driver’s licence always safe and proper ID for client identification purposes? No. In LAWPRO’s experience, the driver’s licence provided by a fraudster client is almost always fake. To confirm that a driver’s licence is valid, use the Ministry of Transportation’s online Driver Licence Check at https://www.dlc.rus.mto.gov.on.ca/dlc/OrderForm.aspx. How hard is it to spot counterfeit cheques or bank drafts? Will the bank address or contact information on them be correct? Some of the counterfeit cheques or banks drafts we see are obvious, others are of high quality and appear valid to all but the trained eye. Fraudsters will provide fake contact information on documents, including the phone numbers on counterfeit cheques or bank drafts. While a branch address may be correct, phone numbers will connect you with fraudsters or someone in cahoots with them. This ensures that any call to verify the validity of the document reaches a person that is in on the fraud, not a real bank employee that could end the fraud by indicating that the financial instrument is not valid. When verifying important information (such as the validity of a certified cheque or bank draft), always find the phone number to use from an independent source. How sophisticated are these frauds? Will multiple people be involved? Some of the frauds are very sophisticated and have involved multiple people who pretend to be the different parties to the transaction e.g. the client, lender, seller, buyer etc. The frauds are getting much more sophisticated, and there are usually multiple accomplices involved. All of the documents will look real and be drafted to make the transaction look legitimate. They will put you in touch with co-conspirators. In one commercial loan fraud, the target LAWYER spent many hours over several days going back and forth with a representative of the supposed lender negotiating terms of the loan and security documentation. On another fraudulent matter, loan instructions came from someone pretending to be a major bank employee. Several of the LAWYERS targeted by attempted and successful frauds have said that in hindsight they were surprised at how friendly and talkative the fraudsters were. The fraudsters seemed to have all the right answers to any questions they were asked. The fraudsters even played on cultural connections where they existed. Remain on high alert and don’t let your guard down. Frauds are becoming ever more sophisticated, and the fraudsters appear to be going to ever greater lengths to try to trick LAWYERS into accepting bogus cheques or bank drafts and disbursing good funds from their trust accounts. Where can I learn more about recognizing and preventing fraud? The practicepro.ca fraud page has a wealth of information that will help you recognize when you are being targeted by a fraud and what you can to avoid being duped. Where can I learn more about the different forms of funds transfers, and the risks associated with each? LVTS vs. ACSS: Funds Handling in an Electronic Environment explains the two systems used by the Canadian Payments Association and the benefits of each.